1. Definition Serum is the liquid part of the blood after the coagulation. Plasma is a clear and yellowish fluid part of the blood. 2. Composition Serum is the water fluid from blood without the clotting factors. Plasma is the blood fluid that contains blood clotting agents. 3. 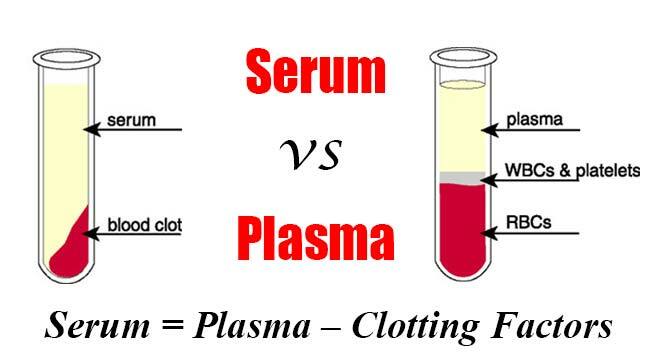 Volume Volume of serum is less in comparison to plasma. Plasma is a clear yellow liquid which is 55% of total volume of blood. 4. Isolation Serum is acquired from the process of spinning after clotting. Plasma is acquired from the process of spinning before clotting. 5. Isolation Procedure Serum is more difficult and time consuming to separate. Plasma is easier and less time consuming to separate as compared with serum. 6. Use of Anticoagulants Serum does not need anticoagulants for separation. Anticoagulants are necessary to separate plasma. 7. Composition Serum contains proteins, electrolytes, antibodies, antigens and hormones. Plasma is considered as the medium of blood in which RBCs (Red Blood Cells), WBC (White Blood Cells) and other components of blood are suspended. 8. Composition (Antibodies) Serum contain antibodies and cross react with recipient antigen. Blood plasma contains antibodies, a type of protein that can fight a substance considered foreign to the host body. 9. Composition Serum contains proteins like albumin and globulins. Plasma contains the clotting factors and water. 11. Composition (Water) Serum contains 90% water. Plasma contains 92-95% water. 12. Storage Serum can be stored at 2-6 degrees centigrade for several days. Frozen plasma can be stored for up to a year. 13. Density Serum has a density of approximately 1.024 g/ml. Plasma has a density of approximately 1025 kg/m3, or 1.025 g/ml. 14. Arrangement Cells are usually attached together by clot formation. Cells are not attached together and suspended in plasma. 15. Uses Serum is the most preferred part of blood used in checking blood groups. Plasma is delivered to the patients who lack blood cells. 16. Uses Serum is an important source of electrolytes and animal sera are used as anti-venom, anti-toxins, and vaccinations. Plasma contains proteins that help in the transportation of material such as glucose and other dissolved nutrients through the blood. Can we calculate the hormones concentration from plasma and if we have to samples of same blood having plasma and serum. can we calculate the hormones ie testosterone, what will be result is it ok to calculate with serum and plasma. Hello. Very good effort however in differences between serum and plasma you stated in No. 8 that plasma doesn’t contain antibodies. This is not true as you know because antibodies are soluble and aren’t removed by the process of coagulation. You didn’t check properly. It is written there that Plasma contain antibodies that fight foreign agents in the host body.